State Senator Sandra Williams (D- Cleveland) applauds the Ohio Senate for passing Senate Bill 116. Joint-sponsored by Senator LaRose (R-Hudson), Senate Bill 116 permits an individual who has to quit work to accompany the individual’s spouse on a military transfer to be eligible for unemployment compensation benefits. “A loss of income can have a detrimental impact on families and it’s imperative that as legislators we do everything in our power to keep families together and I believe passing this legislation will do just that,” said Senator Williams. 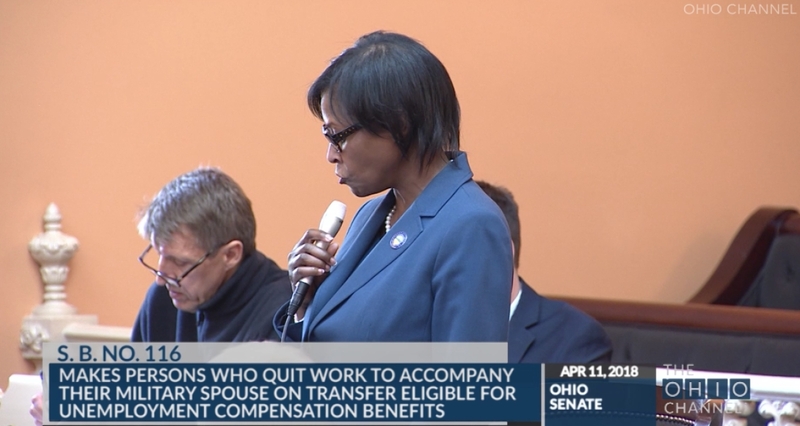 Senate Bill 116 will help alleviate some economic concerns by allowing military spouses to be eligible for unemployment compensation benefits if they must discontinue their employment to accompany the military member to whom they are married. Not only is this policy endorsed by multiple veteran’s organizations, but is also supported by the US Department of Defense and the Ohio National Guard. Senate Bill 116 has bipartisan support in the Senate and will move forward to the House of Representatives. Additional information, including the draft of the document and its current legislative status is available here.